It's finally here! 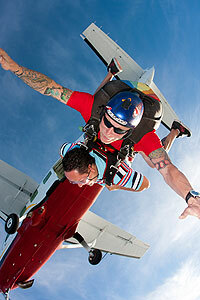 The adrenaline junkie's favorite activity - sky diving. Now you can experience the sheer thrill of free-fall from 14,500 feet (4,420 m), and the incredible panorama of Puerto Vallarta from the air. You'll float down and land right on the beach! An incredible memory on your vacation. After a safety briefing, you'll board the airplane and climb to 13,000 feet (3960 meters). You'll launch from the plane, and with your instructor securely fastened to your back, you'll fly through the skies above the Sierra Madre and Puerto Vallarta. Because you'll be in front, with your own altimeter and ripcord, it will feel like you're doing a solo dive, but your instructor will be right there with you for safety. Your instructor will tell you when to pull the ripcord and help you steer your parachute into the landing spot on the beautiful Flamingo Beach in the small town of Bucerias, north of Puerto Vallarta, where you can purchase an optional video of your flight. Departs From: Aerotron near the Puerto Vallarta Airport. Exact meeting instructions will accompany your confirmation. Extra Cash for Video, Return Taxi, etc. Kids: All ages welcome. Must be 55 inches (140 cm) tall and weigh at least 90 lbs (40 kg) to participate. Parents must sign a waiver. Kids same price as adults. This tour requires only a deposit to confirm the reservation. The remainder will be paid in cash on the day of the tour.